Walker's second walnut grew at Alva, Stirlingshire. It was planted in the garden by Sir John Erskine anno 1715, in presence of his brother the Lord Justice Clerk Tinwald, afterwards proprietor of the estate. In October 1760, at 2 feet from the ground, it girthed 5 feet 4 inches. This tree we find, after careful inquiry, is departed, but neither date nor manner of its decease has been preserved or recorded. Walker next refers to "a number of walnut trees at Cames" (Kaimes), isle of Bute, "vigorous and well grown," which in September 1771 were about seventy years old. "They were then," he remarks, "between 50 and 60 feet high, and the largest of them girthed at 4 feet from the ground, 6 feet 1 inch." On inquiry and careful investigation by Mr Kay, the able and intelligent wood manager on the Kaimes estate, we have ascertained that none of these trees now exist. When they were felled, or how they disappeared, not even the oldest inhabitant can tell, so much had they probably been regarded as merely ordinary hard-wooded trees at the time of their disposal. It is, however, somewhat remarkable than in the island of Bate, a district isolated, and replete with many very remarkably large and notable trees of almost every variety, no instance of a walnut of anything like timber size has been obtained. Thus it is that frequently in the most likely localities, as regards soil, climate, and other circumstances, the enthusiastic explorer is disappointed, while in the most unexpected quarters, often rare and remarkable specimens of different descriptions of trees are found. And as a further instance of this, we need only notice Walker's fourth, and indeed only large walnut, — which "grows," says he, "before the front of Kinross House, in Kinross-shire, and in "September 1796, measured at 4 feet from the ground 9 feet 6 inches in circumference." He further adds—"The house of Kinross was finished by Sir William Bruce in 1684, and the tree appears to be coeval with the house. It is probably the oldest and largest walnut tree in Scotland, and is evidently on the decay, but whether this proceeds from accident or from age it is uncertain." Gilpin, in 1791, in noticing this tree (but without reference to its girth at that date), says, "there are many walnut trees of a size, equal if not superior to that of this tree.È From recent inquiries made for the purposes of this paper,—and seeing it is not mentioned in the Highland Society's Catalogue of Old and Eemarkable Trees, collected in 1863,—we find, and are glad to state that the old veteran is still alive, and in considerable vigour. It now measures at 4 feet from the ground 23 feet in circumference. It is unfortunately shorn of much of its grandeur, from having lost some of its largest limbs, but still evinces considerable vitality. feet above its level. The site is the most westerly point on the mainland of Scotland where trees grow. Nothing is certainly known of its age, but from circumstances connected with the history of the Mackenzie family, it was in all probability planted between 1755 and 1760. Another fine old walnut in the north of Scotland is at Altyre (Morayshire). Viewed in 1881, this venerable patriarch, which stands close to the mansion house, has evidently seen its brightest and best days; but hooped as it is with strong iron clasps, it may stand the blasts of many a winter yet. It is quite hollow, has three large limbs still remaining, a fourth having been removed as it threatened an outhouse of the mansion, and is now, though crowned with a leafy head, evidently "living on its bark." It girthed 15 feet 2 inches at 1 foot and 13 feet at 4 feet from the ground. The soil is a deep sandy loam, recumbent on gravel. It yields large crops of fruit, which ripen almost ever year. There are other trees in Morayshire of nearly similar dimensions, but on account of the soil and situation which they occupy, being somewhat later, it is only in very favourable seasons that their fruit becomes fit for dessert. 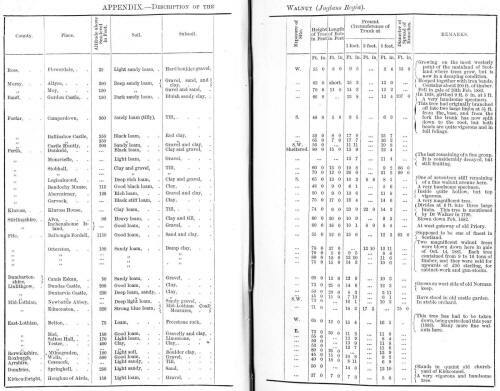 Since the notes for this paper were prepared, it is unfortunate to have to record regarding this interesting old walnut, and also regarding the one at Moy (Morayshire), also mentioned in the appended list of old trees, that both veterans succumbed to the wrestling hurricane of 26th February 1882. The largest walnuts, and probably with few exceptions the finest trees as specimens found in Scotland, are in Perthshire. Referring to those noticed in the appended list, specially may be noted the fine example growing at Moncrieffe, in a light loam soil, upon a gravel subsoil. This tree, which is extremely picturesque, is the last survivor of a fine group which occupied a space of ground, supposed to have been adjoining the original garden. The largest erect tree of the group measured in 1880, 13 feet 7 inches at 1 foot from the base, and 10 feet 9 inches at 5 feet from the ground. The trees composing this group had to be taken down in April 1881, for the extension of an avenue, and the only survivor left, and already referred to, is now, at 5 feet from the ground, 11 feet 4 inches in circumference. It is, however, considerably decayed and lying in a procumbent position on the ground, but it is still evincing its vitality by a good crop of walnuts this season, well filled, and quite fit for table use. The system of planting walnut trees in groups does not appear to have been so common in Scotland during last century as in England. It appears rather to have been the practice to plant in lines or in straight rows at considerable distances apart, and this plan was probably adopted from a belief that the heavy foliage and dense shadows cast was inimical to the crops underneath and around, and an idea also prevailed that the bitter juices contained in the falling leaves in autumn were injurious to the soil. Traces, however, do exist where the walnut has been planted to form avenues to old buildings. One of the finest of these is still to be seen at Logiealmond, within two hundred yards of the old mansion house. Many of the trees once forming this fine and imposing old avenue were blown down during the great gale in December 29, 1879, when the Tay Bridge disaster occurred; and one or two also succumbed to the storms of last spring (January and February 1882). There are, however, still seventeen trees standing, and at present four of the last blown ones are lying on the ground as they fell. The trees, reckoning from the concentric circles, are about 110 years of age ; the largest still surviving measures, at 1 foot above the surface 10 feet 3 inches, at 3 feet it is 8 feet 8 inches; and at 5 feet, 8 feet 1 inch in circumference. The seventeen trees will average from 6 to 10 feet in circumference at 1 foot from the ground. The Kinross House walnut has long been considered to be the largest tree of its species in Scotland; but this is not so, for reference to the appended list will show that at least one tree is larger. This premier walnut exists at Stobhall, Perthshire. It is no less than 26 feet in girth at 1 foot and 21 feet 2 inches at 5 feet from the ground, with a massive bole 12 feet in length, and a total height of 70 feet, and the diameter of its spread of branches is 99 feet. It is in a vigorous condition. Another picturesque old Perthshire walnut is to be seen at Abercairney near Crieff, It stands near the site of the old mansion house. The inside of the trunk and heavy limbs are very much decayed and quite hollow, so that a full-grown man can stand inside the trunk, while the holes in the giant limbs are the haunts of many species of the feathered tribe. The top of the tree appears quite vigorous, and when in foliage looks perfectly healthy. It grows in a good loamy soil, upon clay and gravel subsoil, at an altitude of about 120 feet above sea-level. Growing on the lonely island of Inchmahome, in the lake of Menteith, are some interesting and picturesque old trees. They are chiefly Spanish chestnuts, but amongst these are several walnuts around the old garden of the priory. One fine specimen given in the appendix, stands sentinel-like and confronting a large Spanish chestnut at the western gateway of the priory. These two trees, as well as others of the same species, have evidently been selected to fill special points in what has in the Middle Ages been a well-laid out and artistically arranged pleasure ground. The Spanish chestnuts on the island have been already described in the chapter on that species, and need not now be referred to. Mary, Queen of Scots, when a child, is said to have resided for a time on this island; and part of the old garden, the quaint walks of which are still traceable, with their boxwood edgings now grown into trees 20 feet high, and fully 3 feet in girth, still bears the name of "Queen Mary's bower," and "Queen Mary's garden." The walnut tree referred to in this site is still sound to all appearance, and its foliage looks quite healthy, while it fruits quite freely every year; but from a crevice near the root on the east side, it is "oozing" slightly, as old walnuts frequently do, indicating incipient internal decay. We need only notice cursorily the walnuts of notable appearance and dimensions to be found south of the Forth, as for instance at Dundas Castle (Linlithgowshire), Duntarvie Castle (Linlithgowshire), Newbattle Abbey and Edmonstone (Mid-Lothian), where the largest specimen south of the Forth which we have been able to find still exist. It is now 18 feet 2 inches at 1 foot and 17 feet 3 inches at 3 feet from the ground. The soil is a strong blue loam, overlying the Mid-Lothian Coal Measures, and the altitude of the site is 320 feet The tree is quite vigorous. Fine examples are also recorded in the appendix at Belton, Salton Hall, and Yester (East Lothian), and Milnegraden (Berwickshire). At Wells (Roxburghshire), at an altitude of 500 feet, we find a very fine tree with a beautiful bole of 15 feet, and girthing 10 feet 8 inches and 9 feet 2 inches at 1 and 5 feet respectively, showing the suitability of the walnut to such an altitude. In the south-west division of Scotland, fine trees are found at Cessnock Castle (Ayrshire); and in the quaint old churchyard of Kirkconnel (Dumfries), a picturesque old example still exists. It is 50 feet in height and girths 14 feet at 1 foot and 13 feet 10 inches at 5 feet above the ground. This fine old tree is very much swayed to one side, from the soil and subsoil both being sandy, and its three massive heavy limbs, which spring quite horizontally from the trunk in one direction, with their additional weight of foilage, being a severe strain upon the roots. It presents a very weird appearance, and is an appropriate and suitable feature in the foreground of the quaint old parish churchyard and its surroundings. Having thus discussed the statistical features of the principal trees in Scotland which we have been able to discover, we may now proceed to notice the general characteristics of the walnut, and its capabilities and value as a timber tree in Scotland. The scarcity of old and remarkable walnuts in Scotland, both at the present day and when the older authorities, such as Evelyn, Walker, Selby, and Loudon collected statistics, has been already referred to, and we may now, perhaps, consider if it is not possible to discover the reason why a tree so valuable, alike for its fruit and for the high price which its timber fetches when of large size, is not found so extensively distributed over Scotland as one might expect it to be, considering these special qualities, and its suitability of habit and hardihood to our climate. That is it quite hardy in Scotland there can be no doubt, for we find it even in the northern counties of Scotland of large size, highly ornamental and regularly fruiting, and in favourable autumns ripening its fruit sufficiently for use as dessert. Nor is the soil unsuitable, for it will thrive in almost any soil not water-logged, though it prefers, like the oak, a strong adhesive loam, if the subsoil be well drained or free from constant damp. Nor does altitude of site much affect it in this country, for we find it of large size and quite hardy, flourishing at altitudes of 500 feet and upwards in Scotland, as, for example, at Wells (Roxburgh shire), where it is 10 feet at 1 foot and 9 feet 2 inches in circumference at 5 feet from the ground (vide appendix); while at Hawkstone Park, in Shropshire, at 1000 feet above sea-level, there is a fine specimen 99 feet in height, and 22 feet in girth at 1 foot and 16 feet 6 inches at 5 feet from the ground, with a circumference of branches embracing 279 feet, The causes of the scarcity of fine trees in this country must, therefore, be looked for to other than climatic reasons, and it may probably be accounted for on the following grounds. The walnut in Britain never has been, at any period since its introduction, propagated either as a timber or as a fruit tree to anything like the same extent as it has been in France and other continental countries, where from an early date every possible encouragement has been given to its increase and cultivation. In this country it has been more planted as an ornamental or park tree, its chief use when cut down being for the manufacture of gun or musket stocks, for which it was formerly in great demand, and for the supply of which large quantities of walnut timber were imported from the Continent. During the Peninsular wars, when many of the chief continental ports and markets were closed against us, walnut timber in Britain rose to an enormous price, as we may judge from the fact of a single tree having been sold for £600 ; and as such prices offered temptations which few proprietors were able to resist, a great number of the finest walnut trees growing in this country were sacrificed about that period to supply this trade. 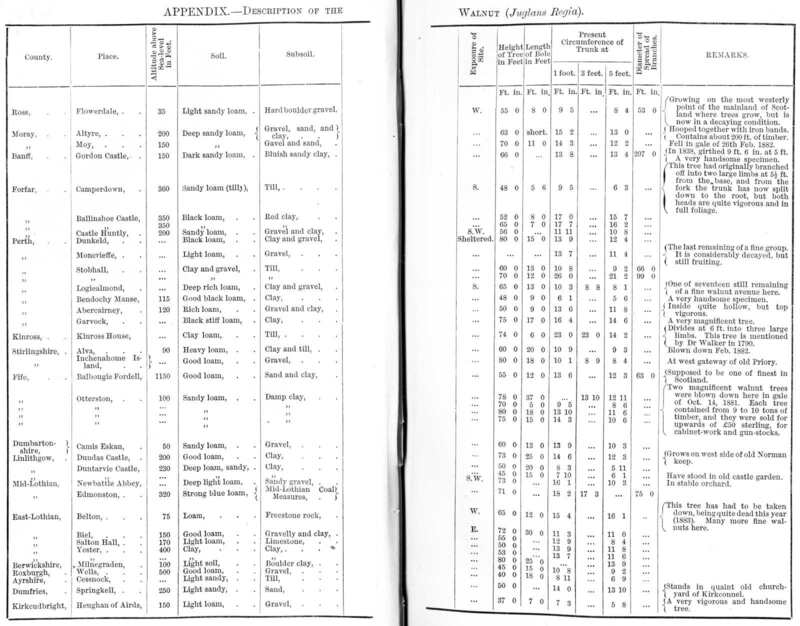 The deficiency and scarcity thus created, as well as the high price, led to the introduction of the American walnut timber, as well as of large supplies from the coasts of the Black Sea, from whence any quantity can always be obtained, and at prices lower than the timber can be grown for in Britain. Hence this facility of procuring unlimited supplies from abroad has also done away with the inducement to plant walnut trees in this country, where it is a slow-growing and long-lived tree before reaching maturity as a timber crop, and its cultivation as such may be said to be at an end in Great Britain, and especially so in Scotland. The few specimens left to us of any magnitude show well as trees of position, and for effect, in the landscape, as well as for variety of foliage in mixed plantations, but only as such will the walnut take its place among the forest trees of Scotland in the future. Indeed, it is probably best adapted for planting now as a park tree, or in hedge rows; for, in mixed plantations', its enormous and deep-penetrating roots,—indicating great power and resistance to the elements,—and its impatience of interference, evince its unsocial habits, and mark it out as better fitted for an open or exposed site ; and the only objection that can be stated to its extensive introduction as an ornamental tree of first importance, is its late period of coming into foliage in spring, and the early shedding of its graceful light green pinnate leaves, which fall at the earliest approach of the first autumnal frosts in our latitude. It does not admit of being pruned at all when of any size; this operation, if necessary, should only be done when the tree is quite young, and never close to the main stem. Such treatment would be most injurious to the tree, and its pernicious effects are observable in old trees which have come under our notice in Scotland,—such a process of close-pruning having invariably produced decay more or less at the lower edge of the wound, caused doubtless by the wood being naturally capable only of slow cicatrisation, and also from the soft loose texture of the young wood of a tree which otherwise, when allowed to mature and ripen, produces a timber of close-grained quality, of beautifully coloured and veined appearance, and of the very finest quality for all artistic and ornamental constructive purposes or for internal decoration and furniture. Evelyn states that it had been observed by a friend of his that the "sap of the walnut tree rises and descends with the sun's diurnal course (while it visibly slackens in the night), and more plentifully at the root on the south side, though those roots cut on the north side were larger and less distant from the trunk of the tree, and that they not only distilled from the ends which were next the stem, but from those that were cut off and separated," and which, he observes, "does not happen in birch, or any other sap-yielding tree." (Evelyn's Sylva (Hunter), vol. i. book i. p. 171.) It is a pity the worthy and observant arborist does not tell us more of the details of the experiments and observations by which he arrived at this conclusion regarding this relation between the sun's diurnal course and the flow of sap in the walnut tree, which he seems to point to as unique. May it not have rather been, or be perhaps, due to lunar influence, if such a phenomenon, as he alleges, exists at all, and afford inquiry, or fair field for investigation into a matter of the most profound interest in the economy of the vegetable kingdom and arboricultural world, viz., the periodicity of the rise and fall of sap in trees throughout the various periods of the moon's growth and decline in all months of the year,—a function probably which, if better understood and investigated, may be found to correspond to a similar law in the animal kingdom for keeping alive and periodically revivifying and quickening the latent forces of nature. Many curious old and superstitious practices and ideas prevailed in the last century regarding the walnut tree. These were particularly common in Germany and in other countries of the continent of Europe. In Frankfort and Hanau in Germany, until a very recent time, no young farmer was permitted to marry till he had given proof that he had himself planted, and was "the father" of a stated number of walnut trees —a law which was most religiously enforced down to very recent times, so great was the advantage supposed to be to the inhabitants, and to the country generally, from the abundant presence of the walnut tree. In olden times, again, the fruit of the walnut was wont to be strewed by the bridegroom at a wedding,—to indicate that he had, on entering his new phase of life, cast aside his boyish amusements and games, or perhaps more likely to signify that his bride had desisted from being any longer a votary of Diana, to whom the walnut tree was sacred. From a very early date, the individual properties of the walnut, in many parts of the Continent, were held in great veneration and repute. It is almost ludicrous to recount some of its fancied curative properties and the superstitious practices prevalent regarding these ; and with respect to the various parts of the tree,—fruit, foliage, oil, and bark. Thus,—a bitter decoction of the leaves and husks of the fruit macerated in hot water, and spread upon lawns or garden walks, would destroy worms and slugs without injuring the greensward. The water of the husks was believed to be an unfailing antidote against all pestilential infections, and that of the leaves to heal inveterate ulcers. The green husks of the fruit boiled used to make a good dye, of a deep yellow colour without any mixture. A distillation of walnut leaves with honey and urine would make hair to grow upon bald heads. The kernel masticated, if applied to the bite of a suspected mad dog, and after it has lain for three hours, if cast to poultry, they will die if they eat it, should the dog have been mad. In Italy, at the present day, the country people drink a pint of fresh walnut oil to cure any pain in the side or liver, and are said to receive immediate relief; but "more famous," says Evelyn, "is the wonderful cure which the fungous substance separating the lobes of the kernel, pulverised and drank in wine in a moderate quantity, did perform upon the English army in Ireland, afflicted with a dysentery, when no other remedy could prevail." The juice of the rind was also used as an effectual gargle for sore throats. With such a list of healing virtues, real or supposed, no wonder that the walnut tree has been so extensively propagated in continental countries; and probably, owing to a belief to some extent in these reputed qualities, it was first introduced into this country by the early monks from the continent of Europe; and hence the earliest specimens now extant are, as we have shown, chiefly to be found flourishing beside the mouldering ruins of the old ecclesiastical foundations of their departed hierarchy.